The story of CancerNursing.org to date is the story of carefully-packaged but relatively uncomplicated e-learning resources … bringing high quality cancer nursing expertise to truly international audiences and to many audiences that simply could not access such expertise previously. It is a story of a small group of volunteers working alongside subject matter experts, working with negligible or no budgets, to share previously privileged or rare knowledge on a global scale. 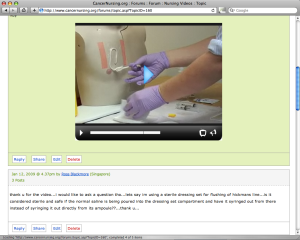 Zara Head, a nurse from the UK, submitted this feedback upon completion of her first course at www.CancerNursing.org. In a few words, Zara pinpoints the key reasons why the learning opportunities offered by CancerNursing.org have attracted tens of thousands of busy health professionals to enrol on its courses and use its learning resources: they are freely available internationally,; they are self-paced and offer ultimate flexibility to the learner, they are high quality, and they keep you “up to date”. Zara is one of over 30,000 health professionals from over 130 different countries that have registered with CancerNursing.org since its launch in March 2003. This case study will tell the story of CancerNursing.org and identify lessons learned from the different phases of its development. Compared to the worldwide uptake it has achieved, the origins of CancerNursing.org are much more local and small scale. Ray’s brother Mark is a cancer nurse specialist who, in 2003, was responsible for raising awareness of oesophageal cancer amongst nurses in his locality. Mark told us how staff shortages made it really difficult to get nurses off the wards for training. We asked him why he didn’t provide the training online. Mark was interested and we offered to help as we were already experimenting out of hours from our e-learning day jobs at Warwick Business School with the development of a platform for building and managing courses. We set about developing the platform for Mark’s course, thinking at the outset that we were simply supporting a small group of nurses in Carlisle. We acquired the ‘cancernursing’ domains (which unbelievably were still available) and quickly realised that they would attract an international audience, so we resolved to make Mark’s course available for free internationally. 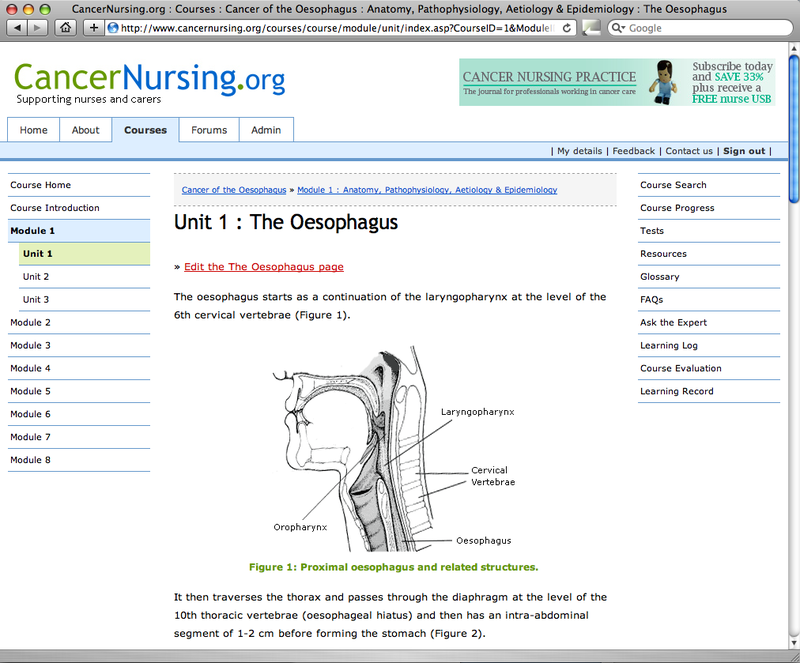 Six months later, CancerNursing.org launched, with its first course on oesophageal cancer, authored by Mark and a team of nurses and consultants from the Northern Oesophago-Gastric Cancer Unit in Carlisle. Within a week of its launch CancerNursing.org had a global reach, with over 300 learners from 4 different continents taking the course in the first 7 days. generate a Record of Achievement for use within personal development portfolios. In the months following the launch of the site and this single course, the number of registered learners grew rapidly; we received a tremendous amount of very positive feedback and a number of subject experts from across the world offered to author further courses for the site. Why would subject experts in teaching hospitals and universities want to do this? In addition to their genuine commitment to furthering nurse education in their area of expertise, CancerNursing.org also gave them something that wasn’t readily available to them in their home institutions: a place where they could freely publish learning materials. Publishing them with us often met their very specific local training need whilst also creating an open international resource, they would often meet a very specific local training need. All of this changed the game for us. We quickly developed guides for authors and peer reviewers and in 2004 we established a charitable limited company, Nurse Learning, to allow us to submit funding applications, receive donations and hopefully grow CancerNursing.org sustainably beyond the voluntary efforts that had given birth to it. From 2004 to 2010 Nurse Learning received limited amounts of funding via educational grants from a small number of charities (for example, The Prostate Cancer Charity) and private companies (for example, Napp Pharmaceutical). In March 2010, we were awarded a grant by the Social Enterprise Investment Fund to employ a project officer for two years to help develop the charity into a self-sustaining initiative. In 2008, Staffordshire University incorporated six CancerNursing.org courses into a Level 1 15 CAT Points Certificate of Credit in Cancer Care, providing learners with a low-cost University-accredited qualification for their CancerNursing.org learning efforts. At the time of writing, CancerNursing.org now offers 15 courses: some on specific (prostate and renal) cancers, some on specific procedures (such as managing syringe drivers), and some on broad areas of care (such as palliative care or caring for children with cancer). We’ve had over 73,000 course enrolments. Over 423,000 tests have been taken and over 2,350,000 test questions have been answered. What lessons can we draw from our experience of producing these substantial, free, structured courses? Firstly, we cannot overstate the importance of the basic, internet lessons and the benefits to humanity of free, global access. Our resolutely Web 1.0 open courses have brought cancer nursing education to nurses whose geographical location or economic or professional situation can prevent them from accessing such opportunities easily, or at all. Moreover, open online publishing has brought the courses to a volume of learners that simply could not be reached by any form of face-to-face delivery (and to numbers that larger organisations with substantial budgets have failed to achieve, either online or off). Secondly, therefore, there is a strong, basic lesson in this story about economies of scale. One of the earliest courses we developed was ‘Cancer Care for Children and Young People’ which was authored by the Paediatric Oncology Nurse Education (PONE) group from the Royal College of Nursing. A core part of PONE’s remit is to look after the supply, the quality and the survival of paediatric oncology nursing education in the UK. The group were finding that there was insufficient regional demand to justify the funding for and the existence of their various ‘entry level’ regional training offerings. By pooling their resources to develop an online introductory paediatric oncology course they more than met the existing national demand, they stimulated additional interest across the UK, reached a vast international audience and all at greatly reduced cost as compared with what went before. Thirdly, one of the strongest and most common messages we received from the volumes of feedback submitted to the site is that the model of the modular course, divided into manageable chunks of content, that can be studied very flexibly, is a very popular and effective method for delivering education to this target group. Nurses have told us that they often have to learn in the midst of their busy ward-based duties, and this often meant for 15 to 30 minutes at a time. Fourthly, we’ve learned of the importance and the real value of providing learners on open courses with opportunities to reflect upon their learning and to evidence completion. Learners are invited at frequent points in their course to post reflections upon cases and activities to their personal learning log, and this has proven to be a popular feature. Even more popular have been the Records of Achievement for each course which learners can access if they complete all of the self-assessment tests within a course. Unsurprisingly, these features also rank as highly valuable where the courses have been integrated into organisations’ training plans. Finally, one of the key lessons we learned is that course development is difficult and time consuming and that we could satisfy the significant demand we had tapped into by smaller, more standalone learning resources. We were devoting a lot of time working with authors to develop substantial, structured courses to our original model. This kind of production is difficult to scale up without decent resourcing and producing such materials on a voluntary or semi- voluntary basis, as we were, was an inevitably slow process. After a year or so we had reached a stage where we had several thousand learners registered with the site, giving us volumes of tremendous feedback, but we were only able to produce two or three new courses a year. Every time we launched a new course and marketed it, new registrations and traffic to the site would increase dramatically. We felt that we could meet the strong demand we were witnessing for high quality cancer nursing education material with resources that were smaller than the structured course. In the process we also wanted to give our members reasons to return more regularly to the site. And so in 2005 we decided to redesign the website and diversify away from only producing courses. The redesign, which went live in 2006, allowed us to bring new types of content and activity into the site. 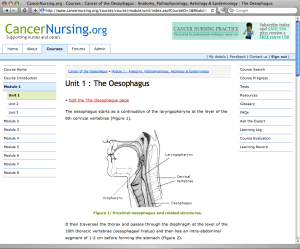 We published feeds of cancer nursing news, we introduced a forum area and we made space for the publication of standalone multimedia resources. These came initially in the form of recordings of online lectures. Our approach to the online lectures was all about quickly capturing ‘content’ that already existed. We tapped into our international network of cancer nursing specialists to invite experts to deliver talks via web conference that they were already delivering locally. For example, wound management expert Wayne Naylor, delivered a session from his lounge in New Zealand at 8pm local time to an audience that included nurses from across the world. Each lecture lasted 40-60 minutes and the presenter was ‘trained’ in using the system in two test sessions. Initially, we used DimDim to deliver the live lectures. Although low cost, it did not prove to be robust enough for our purposes, and we subsequently bought the more reliable Adobe Connect. Ray would upload and manage the presenter’s slides and moderate questions posed by the audience during the session. 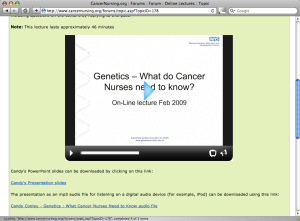 Each presentation was recorded and made available as a Flash movie on the CancerNursing.org website, alongside a downloadable mp3 audio recording of the talk (Figure 2). Of the 12 live lectures delivered, the largest audience contained 65 nurses and the smallest 20. Although difficult to gauge accurately, our server statistics suggest that the number of views of the recordings range from 800 to 6,000, and these figures do not include the number of audio downloads. What lessons have we learned from producing and publishing this series of lectures and recordings? Firstly, and obviously, they are much quicker to produce in collaboration with subject experts than the courses. They require careful preparation so that the lecture is adapted for the context, the lecturer is comfortable with the technology and the event is structured to make it valuable when replayed. Nevertheless, recordings of live lectures allowed us to produce new learning resources with greater frequency. Secondly, when the lecture is explicitly organised to produce a watchable recording, the recording becomes an asset of much greater value than the original lecture. Not only can live attendees replay it at their own pace later; the recording always gains a significantly greater audience than the original lecture. For example, the wound management talk had a live audience of 30 and its recording has been viewed over 6,000 times. This provides another example of the simple, fundamental economies of scale we are achieving. And in our context, economies of scale really means enhancing the global provision of cancer nursing education. Thirdly, entirely unlike the production of our more ‘traditional’, largely textual courses, the success of the lectures depended heavily upon the technical confidence of the subject matter experts. For the majority of the lectures, our subject matter experts were presenting from their location, with our support being provided remotely. Unsurprisingly, our most difficult events were those where our experts were uncomfortable with the context, the technology and the ‘distant’ live audience and our most successful involved international experts (like Bob Becker who has done several online lectures for us on palliative care) who were also very comfortable with web-based communication. In this context, that combination of subject matter expertise and web competency really is a powerful and compelling skillset. Fourthly, we learned a lot about, and began to doubt, the cost benefit of delivering these sorts of learning resources with a broad range of subject matter experts, and as a result we resolved to shift our focus to delivering other forms of learning resource. Providing technical support to ‘non-technical’ experts worldwide proved, on several occasions, to be difficult, time-consuming and frustrating for both parties. After a year we decided to shift our focus, with a view to returning to online lectures when we could be confident that the technical barriers had lowered. Since we began producing courses on specific nursing procedures, such as pain control via syringe drivers, we had received feedback from learners asking whether we could provide instructional videos about the procedures. We had always felt, and the feedback certainly told us, that video was a very appropriate medium for educating nurses about practical procedures, perhaps more appropriate than the step-by-step textual descriptions with images that we used in the courses. One factor that had previously dissuaded us from delivering video online had been a lack of confidence in the ability for all end users to easily receive and play video. However, by 2008, developments in browsers, plug-ins and media players, and the low-cost server technology offered by the cloud (we used Amazon S3 for hosting our video content) meant that end users’ technology was much less of an issue. So, in 2008 we produced and published our first instructional video on Peripheral Cannulation. Our initial videos were all produced by Mark Irving, a clinical nurse specialist. Mark undertook the time-consuming work of planning, scripting and rehearsing the films prior to capturing and editing the content. As Mark’s knowledge of what worked, in terms of camera set-up, lighting, timing, camera angle and so on, increased, the production process became slicker and swifter. The videos were then published within the discussion forums on CancerNursing.org as embedded Flash movies (Figure 3). We have also published videos developed by hospitals and cancer charities. The number of views of the videos has been impressive, generally ranging from around a thousand to tens of thousands of views. What lessons have we learned from the production of instructional videos? Firstly, the standalone instructional video, by its very nature, is a very efficient resource for training about practical procedures. Again, it puts the learner in control. It can be watched, stopped, started and replayed several times over very swiftly. Again, as the numbers above show, it is enjoys real benefits of scale: to have demonstrated how to dress a wound to 3,000 nurses would have required an immense resource in a face-to-face context. 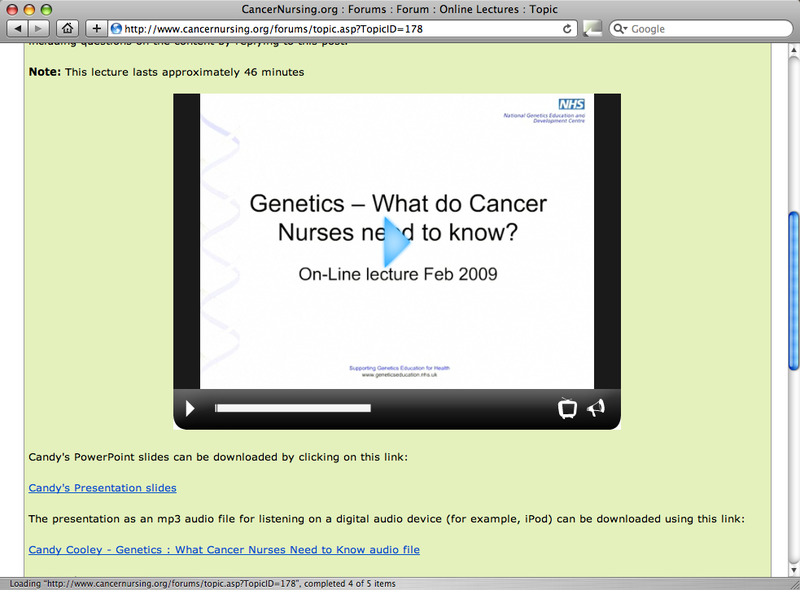 Secondly, publishing the videos in the CancerNursing.org forums allowed discussion on their content to take place, enabling nurses to ask questions and seek clarification. This turned what might often be thought of as a static resource into more of an ‘interactive’ resource. Thirdly, the way in which we published the videos in the forums as ‘social objects’, brought to light key differences in local practice for each of the procedures featured. These differences were not just international differences; they also occurred at very local levels, with two hospitals in the same geographical region differing in practice. So this is partly a lesson about the difficulty of producing open resources internationally when the domain that they cater for differs radically in different contexts. Moreover, we found it to be very difficult to produce videos that catered for many different approaches to a nursing technique while still making them short and usable. Any re-filming and editing that needed to be done following feedback from nurses in the forums was incredibly time consuming to undertake as compared with the textual edits we could make to the courses on an ongoing basis. The story of CancerNursing.org to date is the story of carefully-packaged but relatively uncomplicated e-learning resources – the structured course, the recording of a web conference, the instructional video – bringing high quality cancer nursing expertise to truly international audiences and to many audiences that simply could not access such expertise previously. It is a story of a small group of volunteers working alongside subject matter experts, working with negligible or no budgets, to share previously privileged or rare knowledge on a global scale. At its core, it is the important combination of quality resources, that are relatively low-tech, flexible and standalone, being made openly available internationally, that has accounted for the phenomenal reach and the significant impact of CancerNursing.org. If you would like to support CancerNursing.org by volunteering your e-learning or media production skills to help cancer nurses across the world then we would be delighted to hear from you. This might be by helping edit or develop an online course working alongside a cancer nursing expert, supporting the development of the online community, or filming an experienced nurse undertaking a procedure. Tell us what you can do! Please contact Ray Irving (ray@cancernursing.org) telling him a little bit about your skills and how you may be able to help. ?